The Conservatory01924 372942work CafeThe Conservatory is a small, unique, busy tea room set in a traditional Victorian style surrounding, located in the heart of Wakefield city centre. It is an ideal place for visitors to take a break while shopping. The Tea Room is located on the first floor of The Conservatory premises and is accessed through the sandwich shop on the ground floor/high street level. Customers can choose from a range of fresh hot and cold drinks including a choice of teas, coffees, light breakfasts, sandwiches and gateaux- in addition the very popular Afternoon and Cream Tea's. Full table/waitress service is provided by friendly staff. The Tea Room also has a customer tiolet on the first floor. Customers past and present describe the Tea Room as 'one of Wakefield's best kept secrets'- Come and visit us and share the secret. All day breakfast deal available. Coffee and Gateau offer every day. 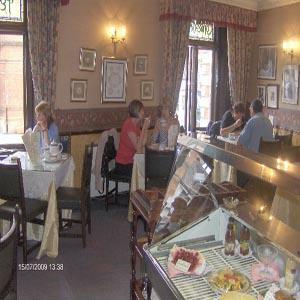 The Conservatory is a small, unique, busy tea room set in a traditional Victorian style surrounding, located in the heart of Wakefield city centre. Tea room is located on the pedestrian precint.